Firearms related new or historical articles you would like to publish? Wish to show your skills as a new writer? Want to republish a good article that you wish to keep for readers a bit longer than in a periodical magazine? Or have something in mind for a column? Here is a showroom on the web for Gunwriters. - War is going as planned. - What is the war plan like? - The Plan is very flexible. - When does the war end? Answering readers' questions is discontinued because of death of the editor of this column, the famous gunwriter P. T. Kekkonen. Technology and History, Parts 9 and 10. I think, it is very important that we teach our children about the True Nature of Government. Now, at last, there is a way to give your children a basic civics course right in your own home! In my own experience as a father, I have discovered several simple expedients that can illustrate to a child's mind the principles on which the Modern State deals with it's citizens. You may find them helpful too. From the very beginning of development of human race the man always applied the weapon for protection, attack, obtaining of food. About his evolution, history of development, parameters, combat qualities we can familiarize in whole mass of the appropriate literature, and also visually by a review of museum exhibits and collections. As you know the guncotton has (nearly) 3 nitro groups (NO2) per cellulose molecule (guncotton is a really extremely long molecule and therefore it is not exact stochiometric). These nitro groups are from the nitric acid used in the nitration process. Nitroglycerol is the ester of nitric acid and glycerol. Guncotton, Nitroglycerol and all the other higher nitro compounds are in their pure form "high power explosives". That means they are able to detonate. A detonation is by far more powerful than any explosion. Photo: Reprinted with permission from " The Ultimate Spy Book", by Keith Melton, Copyright 1996, Dorling Kinderling Limited, London. Issue 2/2000 04.05.2000: JUST WATCH US ROLL ! It took a lot of work but the results speak for themselves. No national insignia has yet been fitted and it is likely that the tank will be painted many times over if it is given a role in a a film or two. The insignia will depend on whose colors the vehicle will star in. One of the Continuation War's Soviet tanks rolled into the Eastern Finland town of Joensuu according to the original plan - though in a somewhat unforeseen way and considerably behind schedule - in 1994. 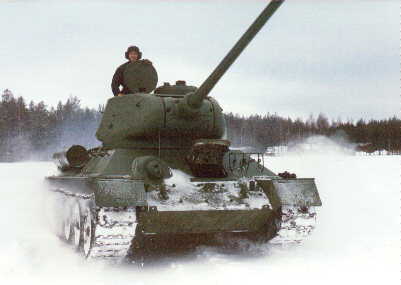 We went for a test drive in this T-34 tank and after the smoke quite literally cleared we sat down to write this article. For all of you who have so many times asked us Gunwriters' editors for stories about suppressor designing - now here is eventually something for you! This story is written by an experienced suppressor designer and gunsmith Mark White of Sound Tech, and he really knows what he is talking about! It should he stated at the outset that the phrase high-powered will cover those fairly efficient, non-magnum cartridges bracketed between the .223 and the .308 - the workhorses of the law-enforcement and military community. If one is going to suppress a sniper rifle, that rifle should he totally dedicated to suppressed fire. Using a rifle which is only occasionally silenced is an invitation to either a lawsuit or to poor field shooting, as any rifle will carry a different zero without a suppressor, as opposed to its zero with one. The world of suppressors is a relatively new one for many of us. With any new concept there is a body of knowledge that must be absorbed in order to make that concept work effectively. A suppressed rifle that is truly quiet is an incredibly useful tool for the wildlife management community. We hope that the information contained in this article will give you a good start on what needs to be known before one can begin operations with an accurate suppressed firearm. Here, Mark White prepares to fire his creation. The Classic Ultralight system handles extremely well. Photo courtesy Alan C. Paulson, author of the book Silencer History and Performance. 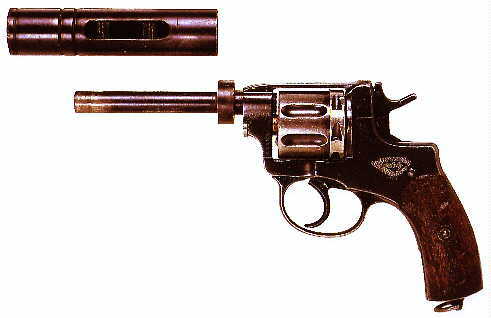 Image: The famous "Dr. Shush" logo of original Maxim silencers - the gentleman's way of target shooting. Not until today the firearms noise control topic has been found again as a solution against shooting range noise pollution and for ensuring effective shooters' hearing protection. 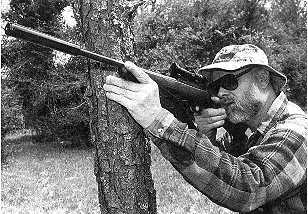 Mark White is a of well known American suppressor expert and writer with a long experience about suppressor gunsmithing. His Sound Technology company manufactures high quality welded suppressors and silencers for shooters' hearing protection and for tactical purposes. He also publishes a newsletter. 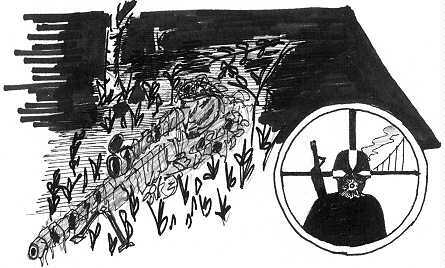 This story has previously been published in the magazine Tactical shooter. Both Mark and Sound Tech were heavily featured in an interview in the September issue of Tactical Shooter, Vol 2, #8. A joint effort of the Finnish Defense Forces (FDF) and Sako over several years brought a new product improved model to daylight, and this rifle was officially adopted as the 762 RK 95 TP. After the initial order by FDF (worth some 16 Million USD) for the new M95 and spare parts, no follow up orders have been planned, nor does there seem to he any funding for future orders. 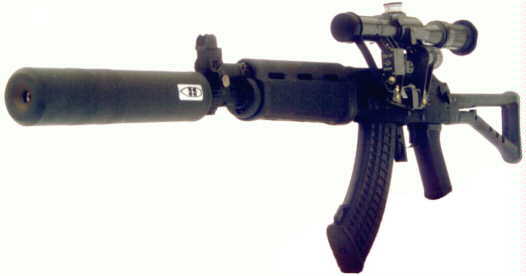 Sako delivered the last assault rifles to the FDF during 1997 and after that the production line will be closed. This in turn means that the production knowledge will eventually disappear and after only a few years it would he difficult to start producing again. Is Finnish assault rifle production "finished" for good? The author, Mr. Robie Kulokivi is a skilled and experienced military assault and sniping rifle expert by his professional career in the FDF. This article has previously been published in the Small Arms Review. - The assault rifle cartridge of the next century? Well, I guess it must be the caseless 4.73 x 33 mm round of the German Heckler & Koch Gewehr-11. - If we look still further ahead in time, what might be the next step in ammo development? - Nobody can tell that! - Maybe nobody can tell for sure, but it can be predicted fairly well on ground of modern technology. Would you believe, if I stated, that in about year 2030 an assault rifle cartridge probably has a straight case and the projectile has a muzzle velocity of 1500 to 2000 meters per second. 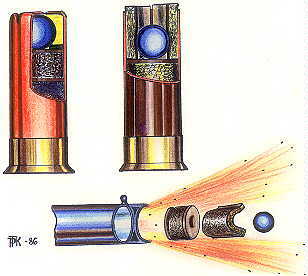 The bullet caliber is between 4 and 5 millimeters, while the bore diameter is much larger, about 9 to 10 millimeters. The assault rifle can shoot both ultra high speed 5 mm bullets, as well as slow 9 mm caliber class rounds - without changing barrels! 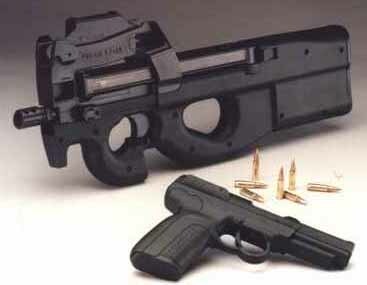 Besides, it is simpler and cheaper to produce than present assault rifles. - You are confusing me! Cut-away drawing: Both the saboted (left) and full caliber versions of the M/2030 cartridge are designed be shot from the same weapon. Caliber can now be changed by changing cartridges only without any modifications to the weapon - which may be of very simple and economic straight blowback type! 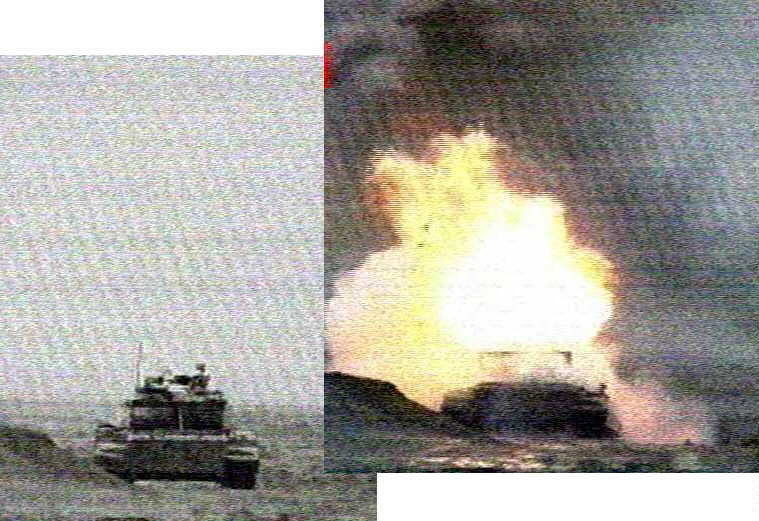 This story was used as a source for December 1999 Small Arms Review (Vol 3 No 3) Page 25: A story based on "2030" concept, written by Alan C. Paulson, and to an article in Ronaldo Olive's Brazilian Firepower magazine: "Cartridge 2030", Munição para 2030. 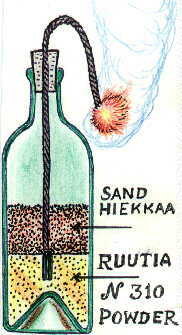 By: P. T. Kekkonen (1999). Part Three: "Are we still again SENTENCED TO READ all this DULL HISTORY ??!" >JESS, dear fellow Hard-Core Handloader, you are ! Love it or leave it ! The history is the very best teacher, even for those researchers who are learning some new findings. Or ESPECIALLY for those "Gyro Gearlooses"...! In Part three: " ... the world-famous ranger-chief LAURI A. TÖRNI (later known as LARRY A. THORNE in the U.S., alias STEVE KORNIE in the book and movie "THE GREEN BERETS") got a "silenced" Mosin & Nagant m/91-30 for the battlefield test in early November 1942..." See an appendix about Lauri Törni at the end of Arcane part 3. 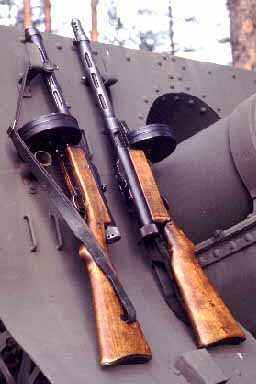 "Famous Suomi submachine gun or machine carbine was developed to be an 'everlasting' piece of equipment. 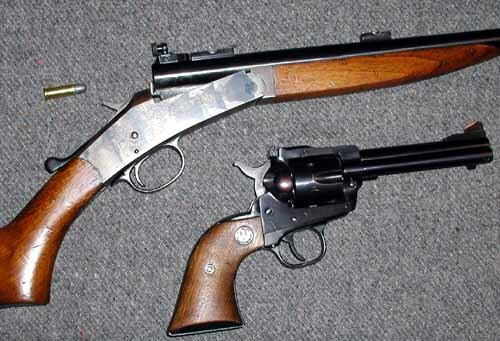 Broken or worn-out parts like extractors, barrels, breech-bolts and wooden stocks were easy to replace, along with recoil springs. Receiver and jacket were truly persistent parts, and small pieces of trigger mechanism did not wear out easily, except some little springs or pins." About the Author: P. T. Kekkonen is probably the best known and recognized gunwriter to Finnish firearms magazine readers, and the only one doing the job full time. 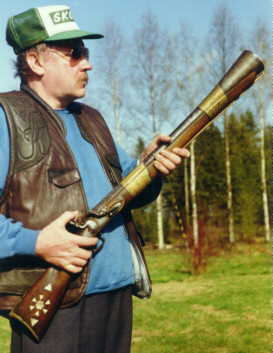 He has also contributed to several books with chapters, drawings and technical and historical details, like the well known book about Finnish firearms, "Arma Fennica". Author of the extensive series of "Silencer History and Performance" volumes, Alan C. Paulson, expresses his gratitude to P. T.'s help by declaring him a "Living National Treasure". The Suomi Submachine Gun, KP/-31 history is a second revised edition, telling in part 2/2 also a short history about Finnish wars that KP/-31 has gone through. First edition has previously been published in the Australian magazine Collector. Photo: Main models of the Suomi: KP/-31 at left and KP/-31 SJR at right. Gunwriters is a voluntarily and without funding maintained on-line firearms magazine. The stories are supplied by contributing high class international writers, selected for publishing by themselves. Reprinting in commercial magazines is admitted only by direct permission from the writer of the story. Gunwriters in Finnish has a different selection of stories.